NAI announces new facilities for their Centers of Excellence and NPI operations in Mexico and China. Troy, MI – NAI, a leading manufacturer of end-to-end connectivity solutions for high performance systems in industrial, telecom, data and medical industries, has established several new facilities within their plants in Hermosillo, Mexico and Suzhou, China. These operations are dedicated to the design, prototyping and testing of cable assemblies, harnesses, box builds, and panel builds. There are separate facilities for fiber optic interconnects and copper. Referred to as “Centers of Excellence” (CoEs) or as New Product Introduction departments (NPIs), these specialized operations include dedicated teams of engineers who design, analyze and qualify assemblies, as well as box or panel builds, before they go into production. The CoEs and NPIs employ over 85 engineers, technicians, advanced sourcing experts and cost estimators. Additionally, the CoEs and NPIs use program management professionals to oversee NAI’s Product Development Process (PDP) and to ensure the product concept is successfully transferred to manufacturing through NAI’s standard Advanced Product Quality Planning (APQP) launch process. The transfer can be made to any of NAI’s seven manufacturing locations in Mexico, China and the U.S. The CoEs and NPIs occupy over 11,000 square feet of dedicated floor space within the existing plants. NAI provides three levels of design services to its customers: build-to-print, design assistance or full-service design. In each case, the CoE or NPI plays a key role in preparing new projects for production. While CoE engineers will take a customer’s build-to-print project and prepare it for manufacturing, these operations are ideally suited for customers who want to outsource the design and development of their fiber optic or copper cable assembly projects. CoEs support the NAI manufacturing process (and the customer’s interests) by employing Design for Manufacturability (DFM) principles in the design stage. Once a product is fully prepared for production, each CoE and NPI assists NAI’s operations teams with the installation and qualification of manufacturing lines. This may include testing, validation and any debugging that might be needed before a product is released for full production. These advanced production lines are specialized for specific types of assemblies, such as fiber optic, coax, HDMI, data, etc. The CoEs are each outfitted with the latest design equipment. They utilize CAD equipment and 3D printers to realize the appropriate design solution that will meet a customer’s require­ments. CAD software platforms include ACAD, SolidWorks, Creo and CorelDraw. FormLabs software is utilized for 3D printing to simulate prototype assemblies. 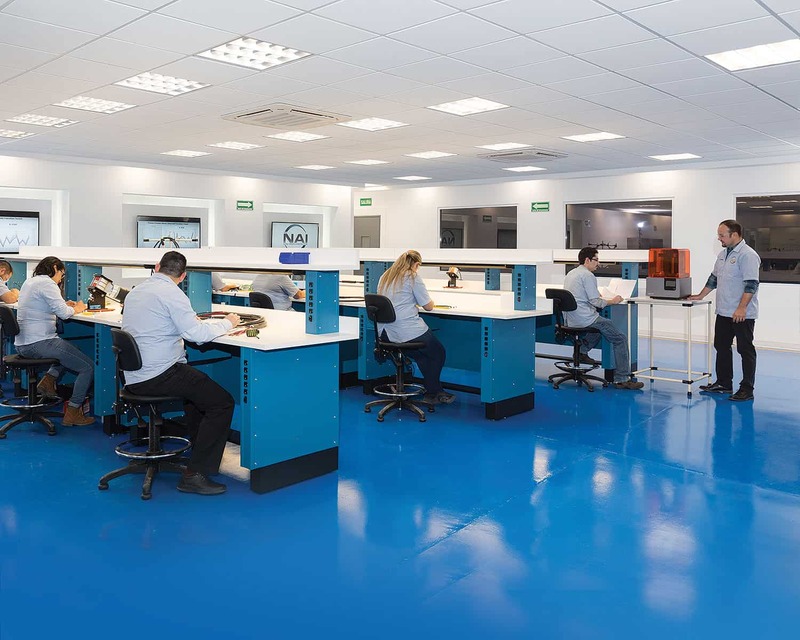 Test operations in the Center of Excellence include environmental testing and bench testing for fiber characteristics and performance. Display monitors provide CoE engineers with project dashboards, allowing them to control the design and testing process. Monitors display project status in real time, with progress percentage and highlights, as well as live thermal test data. To learn more about NAI’s Center of Excellence, please visit the NAI website at www.nai-group.com.